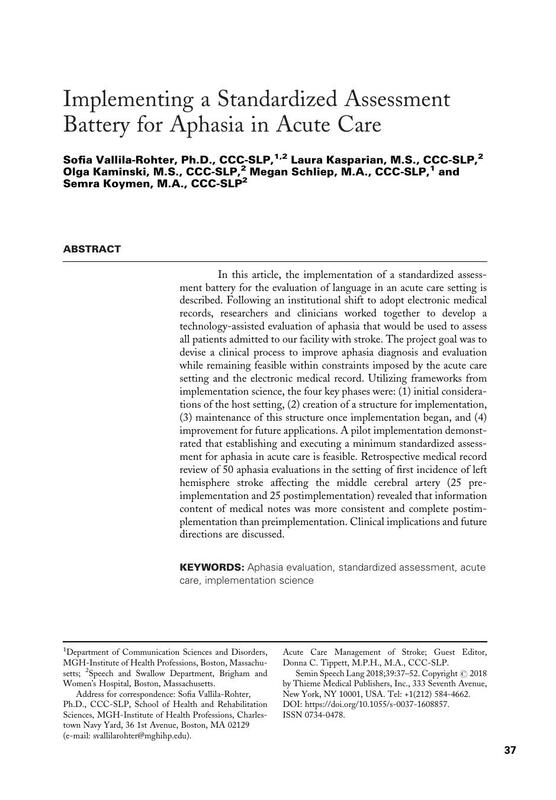 In this article, the implementation of a standardized assessment battery for the evaluation of language in an acute care setting is described. Following an institutional shift to adopt electronic medical records, researchers and clinicians worked together to develop a technology-assisted evaluation of aphasia that would be used to assess all patients admitted to our facility with stroke. The project goal was to devise a clinical process to improve aphasia diagnosis and evaluation while remaining feasible within constraints imposed by the acute care setting and the electronic medical record. Utilizing frameworks from implementation science, the four key phases were: (1) initial considerations of the host setting, (2) creation of a structure for implementation, (3) maintenance of this structure once implementation began, and (4) improvement for future applications. A pilot implementation demonstrated that establishing and executing a minimum standardized assessment for aphasia in acute care is feasible. Retrospective medical record review of 50 aphasia evaluations in the setting of first incidence of left hemisphere stroke affecting the middle cerebral artery (25 preimplementation and 25 postimplementation) revealed that information content of medical notes was more consistent and complete postimplementation than preimplementation. Clinical implications and future directions are discussed.